RTÉ CRIME CORRESPONDENT Paul Reynolds has told the Charleton tribunal he was “shocked” to be nominated by former garda press officer Supt David Taylor as one of the journalists who was negatively briefed about whistleblower Sergeant Maurice McCabe. The tribunal chairman also asked Mr Reynolds how he felt to be named by journalist and academic Colum Kenny as one of two journalists who told him that Sergeant McCabe had been investigated for child abuse. “I feel very very annoyed about that, and I resent that too,” Mr Reynolds said. The tribunal is looking at whether former commissioner Nóirín O’Sullivan influenced or attempted to influence RTE broadcasts on 9 May 2016 in which Mr Reynolds discussed the leaked O’Higgins Commission report into complaints by Sergeant McCabe. The tribunal is looking also at allegations by Supt David Taylor that he was directed when he was garda press officer to smear Sergeant McCabe. Former commissioners Martin Callinan and Nóirín O’Sullivan deny there was any smear campaign. In 2007 the DPP directed no prosecution after a garda investigation into abuse allegations made by Miss D, saying no evidence of a crime was disclosed. Michael McDowell SC said that Sergeant McCabe was standing by his evidence that Garda human resources executive John Barrett told him that former commissioner O’Sullivan had attempted to influence RTÉ broadcasts on 9 May 2016. “Sergeant McCabe isn’t in a position to withdraw anything, he has faithfully reported what he was told by Mr Barrett,” Mr McDowell said. Mr McDowell said it was up to to the tribunal to decide the truth. The chairman said he was required by the terms of reference to investigate the issue. Mr Barrett is due to give evidence later. Mr Reynolds said that he had a statutory obligation to be fair and balanced, and was concerned to be fair to all parties when preparing news reports on the findings of the leaked report of the O’Higgins commission of inquiry for radio and television broadcasts on 9 May 2016. Mr Reynolds said he contacted Sergeant McCabe the evening before the broadcasts to give him an opportunity to respond to what he was going to report. Mr McDowell said that Sergeant McCabe was a serving garda and was under a duty of confidentiality, as the report had not yet been published. Mr McDowell said that Mr Reynolds was “going through the motions” in contacting Sergeant McCabe. “This is too serious for pretence. I have a statutory responsibility to report in a fair and impartial manner. I had to contact Sergeant McCabe,” Mr Reynolds said. Mr Reynolds said that the report ran to 360 pages and he had no doubt Mr McDowell could “go through and cherry pick all the bits I missed”. He was also asked about a text message recovered from a phone belonging to Mr Callinan, which was sent two days before his resignation, which said ” Reynolds would help out if an interview arose somewhere”. Mr Reynolds said he could not be responsible for what other people said about him. Mr Reynolds said he would always be interested in getting an interview with a garda commissioner on record in front of the cameras and his record spoke for itself. “I would certainly interview the commissioner and I would certainly have had some very interesting questions for him,” Mr Reynolds said. In December 2012, Mr Callinan sent a direction to Sergeant McCabe not to access records on the PULSE Garda computer system. The letter also said if Sergeant McCabe had any concerns about policing issues they could be brought to Assistant Commissioner John O’Mahony, who was conducting an internal garda inquiry. Mr Reynolds said that this was a direction to Sergeant McCabe to bring information to the O’Mahony inquiry. He said his job was to take legalistic and disciplinary language and “translate that into a form of words that most people can understand, common parlance”. Sergeant McCabe has previously told the tribunal he was never directed to cooperate with the O’Mahony inquiry and it was incorrect for Mr Reynolds to report that he had not cooperated. Mr Reynolds said he never discussed allegations of abuse made against Sergeant McCabe with Mr Callinan, or the garda investigation into the allegations, which resulted in the DPP directing no prosecution. He said that he had learned four facts after first hearing rumours about Sergeant McCabe in 2013, that there was an allegation, it was investigated, a file went to the DPP, and there was no prosecution. He was not told that the investigation was why Sgr McCabe fell out with garda management. Mr John Ferry, on behalf of former garda press officer Supt David Taylor, said that these four facts were “an absolutely huge and extraordinary set of facts to be presented with at the same time you were hearing about McCabe making the penalty points allegations”. Mr Reynolds said that as a crime correspondent he heard all sorts of things. “As I say, I hear that sort of stuff all the time. There was a clear end on this one. No prosecution, You could see there was nothing in it,” he said. 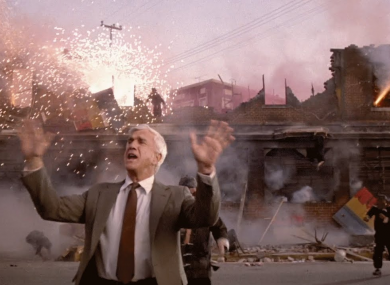 Mr Ferry said that Mr Reynolds was like Frank Drebin in the Naked Gun films, standing in front of an exploding fireworks factory saying there was nothing to see here. Mr Reynolds said there was no smear campaign against Sgt McCabe, and Supt Taylor had not subtly dropped information about Sgt McCabe into conversations at press conferences or crime scenes. “He may be the most brilliant spook in the world, I may be the most gullible man not to realise that I was being taken for a pasty. But the reality is it didn’t happen,” he said. Mr Reynolds said he had heard positive things about Sgt McCabe and he did not regard information about the abuse investigation to be a negative briefing, because Sgt McCabe was exonerated. Email “RTÉ's Paul Reynolds described as being 'a character from The Naked Gun' at Disclosures Tribunal”. Feedback on “RTÉ's Paul Reynolds described as being 'a character from The Naked Gun' at Disclosures Tribunal”.